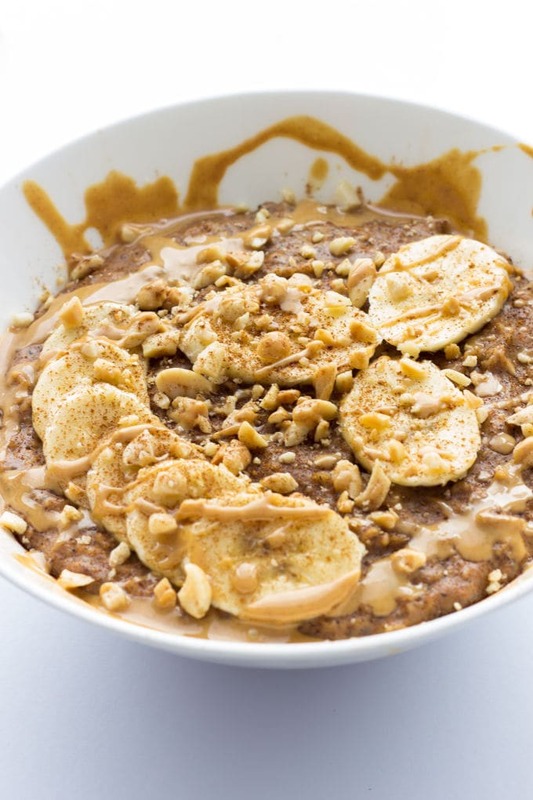 This peanut butter porridge recipe is SO tasty, cozy and comforting! It is easy to prepare and extra healthy. It will keep you full for hours and provide you with all the energy you need to either start your day or to attack a very hard workout! This recipe is fully vegan, gluten-free, egg-free, dairy-free and ready in under 20 minutes. What’s more bland, boring and simply uninteresting that porridge, right? I mean yeah, pure oatmeal is one of the healthiest forms of carbohydrates that one can find. But damn! 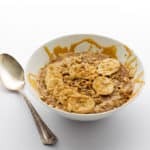 I used to cook plain oatmeal as a quick pre-workout meal and I enjoyed the calm and strong energy that this wonderful grain would provide my body with. You really have to be “taste blind” to enjoy plain oatmeal! I mean yes, the texture can be interesting to some. So, one day I said ENOUGH! To HELL with stewed cardboard! I am Human! I have Rights! It was like crossing the bridge to some other dimension. A dimension where oatmeal actually tastes like heaven and where you would eat it all day every day and be fully happy with it. My whole life changed… My eyes were filled with tears of joy as I was slowly eating this dripping piece of heaven, hoping that this moment of pure happiness would never, EVER end!! 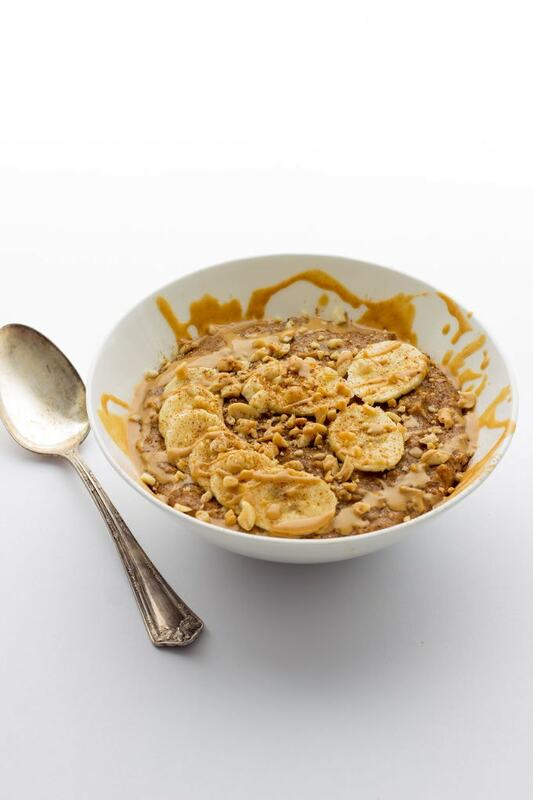 But this peanut butter oatmeal recipe tastes SO good I would eat it all day, litterally! This quick breakfast is easy to make. You can prepare this hearty and comforting meal in pretty much the same amount of time it takes to cook your favorite omelet. It has an intense, but not overpowering peanut butter taste. It is sweet and salty, rich and creamy… Making you feel comfy, wanting to stay home all day watching your favorite show on Netflix. The suggested toppings are the finishing touch. Banana slices bring a touch of freshness, while the ground peanuts are like the violin in this orchestra of tastes, completing this wonderful symphony. Pro tip: To grind the peanuts, you can simply use a small bag, pour them in, seal it and use your fist or a spoon. That is if you do not want to use a food processor or mixer only for this simple step. This is a simple wooden bowl used as a mortar with a mojito pestle. 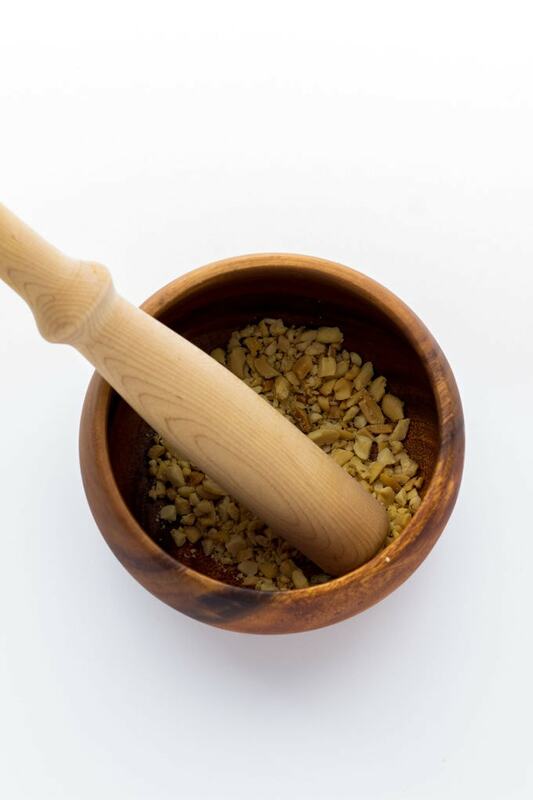 If you don’t have a pestle, you can simply use a tablespoon and press hard. Here is the recipe as promised. Pour the almond milk, chia seeds, cinnamon, nutmeg, maple syrup and vanilla extract in a small saucepan and slowly bring to a boil over medium heat. About 5 to 8 minutes. Stirring frequently. As soon as you see the first bubbles, pour in the oatmeal and mix well. Continue cooking, stirring frequently, until the liquid is mostly absorbed. About 8 to 10 minutes. Turn off the heat then add the peanut butter and whisk well until fully combined. 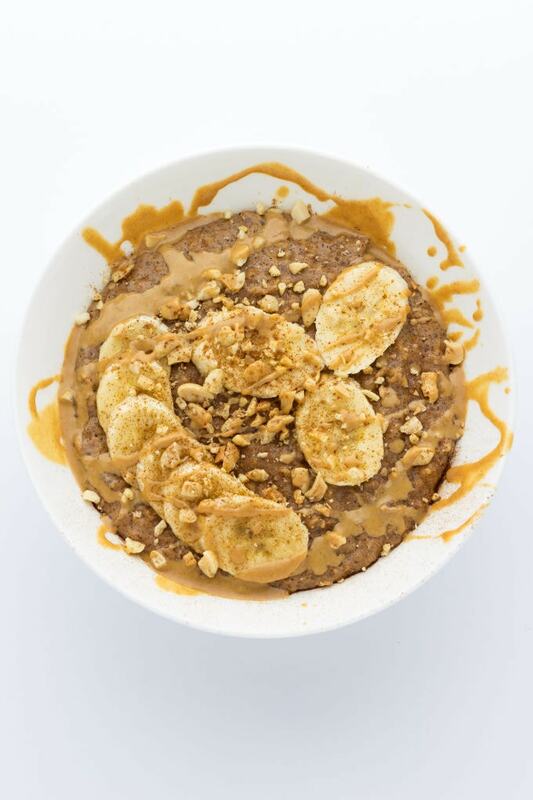 Serve in a bowl and top with banana slices, ground peanuts, some more peanut butter and a pinch of cinnamon. 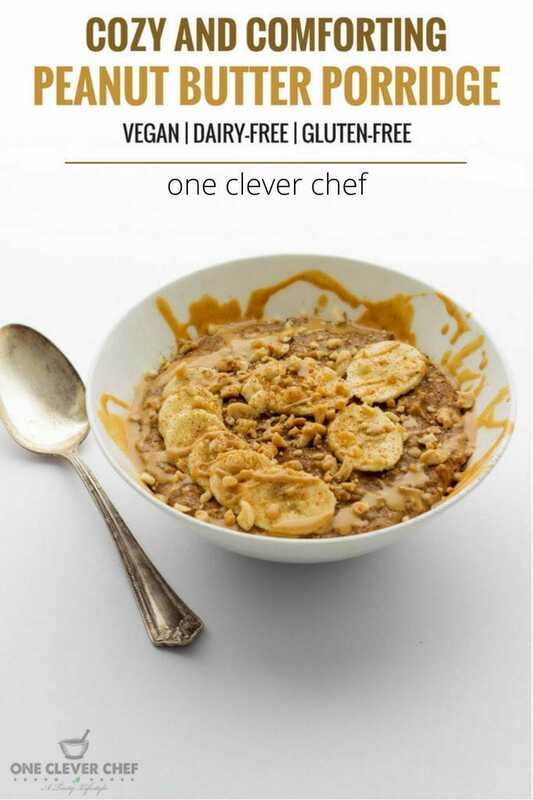 * Optional toppings: 1 large ripe banana, sliced - 1/8 cup ground peanuts - 1 tbsp melted organic peanut butter - Ground cinnamon to taste. ** Nutrition information is a rough estimate calculated without any additional toppings. 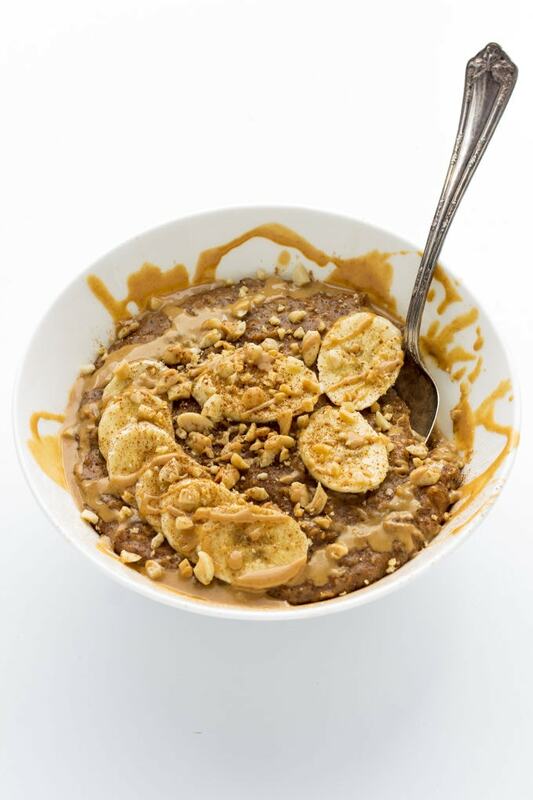 Oatmeal on it’s own is BORING, but with all the peanut butter and glorious add-ins, its da bomb! This looks so comforting! I love oatmeal and this has become my go to recipe, it is my hands down favorite breakfast!